It was a lot of fun making this silly thing and it earned some money for the Zen Center. 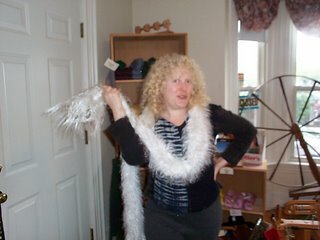 Because of time constraints, the lace scarf almost didn’t get auctioned, but they managed to squeeze it in. 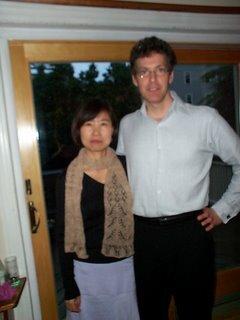 Here is the winner of the scarf, Patrick and his girlfriend Kuen (a couple of the nicest people you ever want to meet!). 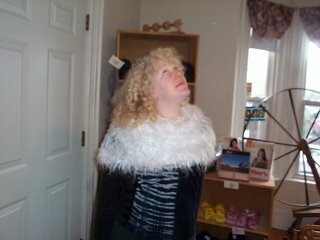 Patrick, of course, got the scarf for Kuen, so romantic! 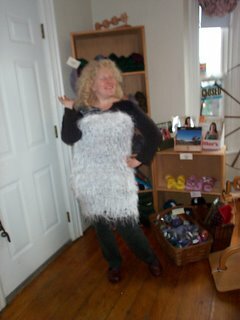 Kuen is a knitter herself so she understands the amount of work that went into making it. I’m very pleased. What am I doing today? Today, I dye cotton for the first time in about 5 years. That is, I will if the UPS man ever comes with my dye activator! In the meantime, I'm busy tracking down all my buckets. Cotton dyeing is all about the buckets! I'll put up pictures tomorrow. Kuen is a lucky woman! I got to see it before it was blocked and it was beautiful! 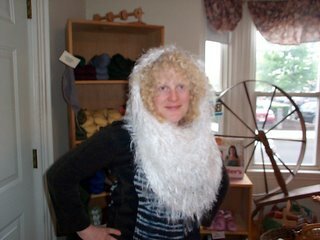 The lace scarf you made is hands down the more marvelous knitted object I have ever seen. Oh, and Zsa Zsa is GLAMOUR all the way! !